The July Stamp of the Month Blog Hop is HERE! Welcome to our Stamp of the Month Blog Hop! 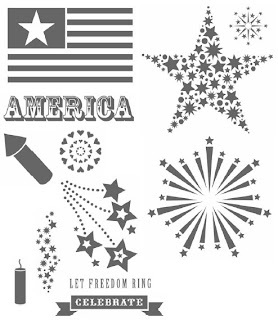 We are featuring the July Stamp of the Month (SOTM), "American Celebration", a set of 12 images. If you have come here from Georgia's Blog you are on the right path! The blog hop is a great big circle, so you can start here and work your way all around. If you get lost along the way, you’ll find the complete list of participating consultants here. For those who have been around me lately, they know I have been struggling with the technique of Paper Pleating. In fact, it's caused quite a bit of laughter. I have used up enough paper trying to figure it out and had finally given up - at least for the time being. Thanks to the Splitcoaststampers website, I was able to locate some directions for this technique and incorporated it into this card. And I must say...after following these directions, I determined that this technique is super easy and super cute! I will be incorporating it into other pieces of artwork in the near future. I also incorporated a little bit of paper-piecing and used our 3-D Foam Tape to add dimension to some images. The White Hemp and blue button were just finishing pieces to this standard-size card. Now "Hop" on over to Michelle's Blog to see her work! Be sure to visit all the Consultants at their Blogs to get some great crafting ideas and other fun ideas! Remember, the SOTM is only available until the end of July, 2011! Click here to see how you can get this stamp set at a discount or even free! I have additional samples viewable on my website! Click here to view them! Supply list: American Celebration stamp set, Fanfare paper packet, Pacifica ink, Sky ink, Cranberry ink, White brads, Stylus, White Hemp, Blue Button, 3-D Foam Tape. My hubby and I ended up driving to my hometown to celebrate Father's Day, our anniversary, and my Dad's birthday with my family. We had a fabulous time with family and friends. It was awesome! We surprised my dad. He had no idea we were going. We started off the Father's Day celebration having breakfast with my parents, joining my grandparents for lunch, and then topping off the day with some delicious fajitas! During the day we took some time to pick and clean up the apricots that had fallen from the tree. It was a windy day and so they kept falling off the tree and hitting us! Us "girls" took a moment for a pose. While getting comfortable and preparing dinner, my Niece decided she needed a picture of us so this is what she took. She's too funny! I was thrilled to spend Father's Day with my Dad. Welcome to our Technique Blog Hop! This month there are 11 of us highlighting the “Beyond Base and Shade Stamping” Technique as shown on page 11 in the Spring/Summer 2011 Idea Book! This blog hop is a great big circle so you can start wherever you want and continue through to see all the fabulous artwork incorporating this technique. If you would like to start from the beginning, please visit this link. While there you will also find a listing of all participants and their blog addresses if you should get lost or want to reference a blog along the way. Let’s get started! If you are coming from Kelly's Blog, you are on the right track! This technique is highlighted with the Bliss paper packet in the Idea Book but you will find variations for its’ use through this hop. I used the Sophia paper packet (my absolute favorite), Friendship Blessings and Card Chatter-Sympathy to create this card, incorporating this month's technique. I stamped the outline image in Black ink and the shade image in Blush. Using a Sponge Dauber and Hollyhock Ink to texturize the edges of the flowers. I used a BIG white brad, white button and pink button for the centers of the flowers. The flowers were stamped in second generation Pear and then inked in Pear on the edges. Please continue onto Rebecca's Blog where you will find some additional artwork highlighting this technique! Be sure to leave a comment and let me know what you thought of my variation and happy hopping! I was inspired, by Debi Barber, to make magnets from our Mix 'n Mingle Album and did so for my group this month. They were a big hit and I will be purchasing and decorating more! The Mix 'n Mingle album has both cardboard and acrylix "pages" in it. The top 3 magnets have both layers on them - acrylix overlay on the cardboard. The bottom two have no acrylix overlay. We embellished them with the Mayberry paper packet and coordinating embellishments. Notice the frame in the bottom right-hand corner. Do you notice the Sky stripes that normally don't exist in this striped B&T? I simply cut strips of Sky cardstock to cover the Olive stripes, allowing for a variation on the colors. Isn't that cool?! (You can even do this in Studio J, our online scrapbooking program.) It offers more versatility to our already fabulous B&T. 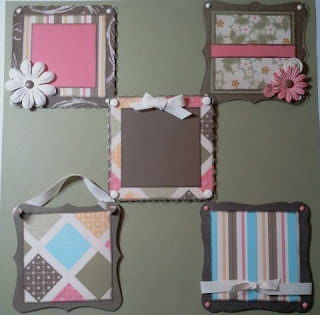 My club member, Terri K., made this hanging frame - switching up the color combo by using the back of the "quilted" B&T pattern, incorporating Honey. She made her paper flower look like a sunflower by using a Sponge Dauber, inked in Cocoa, and stamping it in the middle. The "hanger" for the frame was made by sticking a magnet on the back of a button. How CUTE! Wednesday we were able to spend time with my brother and sister-in-law, Todd and Beverly Crawford. 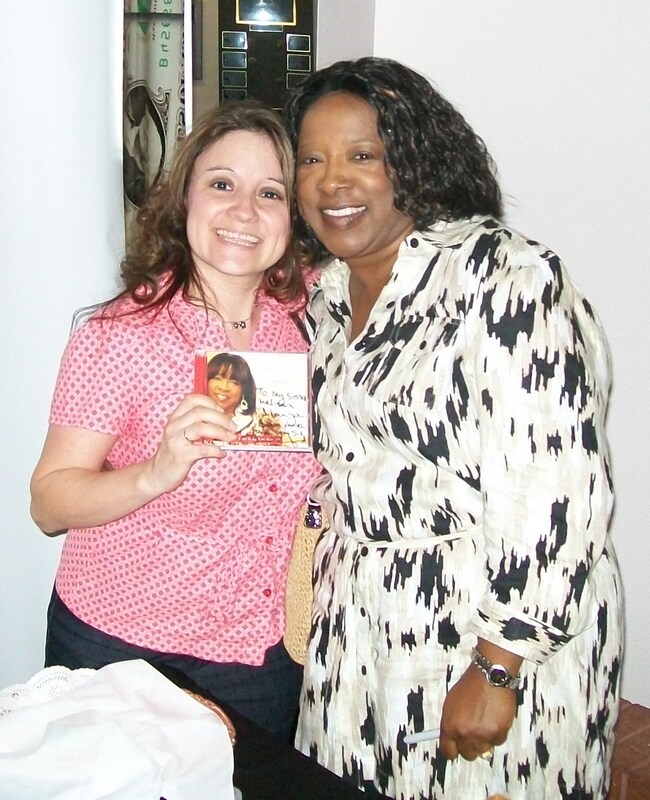 Beverly is a gospel recording artist and was in town for vacation bible school at Dr. Evans church in Oak Cliff. We enjoyed an afternoon of good food and fellowship at Pappadeaux and in the surrounding area and then joined them at the service that evening. Beverly did an awesome job singing her hit song, "It's Time for a Miracle". Kirk Franklin was also at the service and Beverly is blessed by being on his newest CD. (Click here for some additional information.) He took a moment to take a picture with me. Being silly, I asked Beverly to sign my CD and take a photo with me. LOL My husband and in-laws thought it was hilarious. While I'm a diehard Close To My Heart scrapper and stamper, I still had fun fellowshipping with friends and other scrappers at the GASC in Arlington yesterday! I made some purchases that will make some CUTE Convention gift items! I met up with friends I hadn't seen in a long time and shared the day with several of my team members, Xellina, Amanda and Kimberly. We had a great time looking at the different ideas while being surrounded by the excitement of the craft. It was a wonderful day.